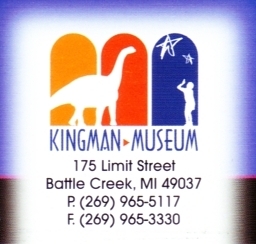 Virtual brochure and information for Kingman Museum, one of many online travel brochures for tourist information in Battle Creek, MI. Provided by your source for Mackinaw Information and Mackinac Information. Michigan’s newest Planetarium - featuring a Digistar 3 SP2 HD Full Dome Planetarium. Located in Southwestern Michigan’s only Natural History Museum. Rates subject to change - Visit www.kingmanmuseum.org for planetarium schedule and featured show.